the structured maxi dresses in light-weight material with a muted print, neutral (grey, olive, black) or medium color scheme, with no sleeves or short-sleeved. Many styles have plunging necklines, but I think that issue can be solved with a camisole or sleeveless scoop-neck shell. If you've been thinking about dabbling in the maxi length, but don't want to make a huge investment while you're experimenting, take a peek at Old Navy. They have a pretty good selection of long dresses in Women and Plus sizes for under $30. 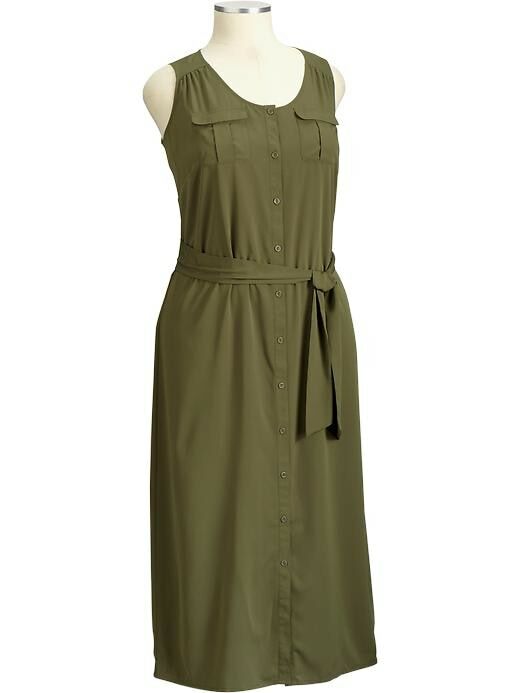 I'd like to try this Old Navy Womens Plus Charmeuse Maxi Shirt Dresses with it opened at the neck. I'd wear a camisole or scoop-neck shell. I might also try it with a ultra-light v-neck, 3/4 sleeve T-shirt and a belt.